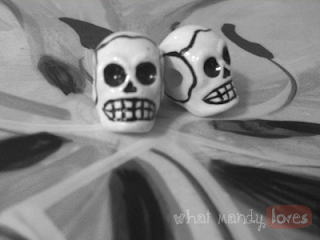 My angsty teenage years were full of black, skulls, metal, and... well, angst. Dearest Mother never understood what was so "cool" about wearing and displaying skulls, especially since she had two daughters. "But it's a human head," she'd say. "What's so cute about that?" Skull memorabilia was all over my room where any Nightmare Before Christmas memorabilia was not, so let's just say I went through my share of skeletal decor. BUT a few pieces have stayed with me once the SS Teenage Angst sailed off to more moody waters. 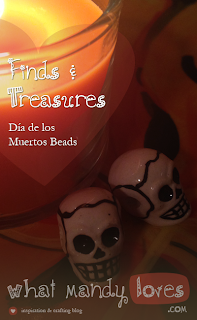 Sugar skulls intrigue me, so these beads stayed along with the mirror. (You may have seen the Dia de los Muertos Mirror from a previous post.) My father purchased these little ceramic-like beauties at some junk shop probably, I don't remember much about them. They're only a centimeter or so in size but they're big on detail. I keep meaning to use them in a future jewelry piece but that just hasn't happened yet. If only I had pieced ears - curse you metal allergies - these would be earrings by now. Happy Halloween, lovelies! Hope it's a spooky one for ya.